← Previous Previous post: Computer names… what’s next? I guess it’s about what type of society we want: one where everyone needs a car to get around or one where a lot of trips can be simply and safely done by walking, riding a bike or using PT. I’m middle-aged, and I bet I’ll never live to see a rail line to Doncaster or Rowville. Mr Abbott seems intent on delivering policies that allow Australians to pump as much CO2 as we can into our fragile atmosphere. I really do not understand the Coalition’s policy here – surely any infrastructure project should be funded (or not) based on its merits, irrespective of mode? And I would have thought that Infrastructure Australia had the final say on funding, not the government of the day? The Coalition`s stand is based on ideology, road lobby power, rural dislike of money going to cities and a desire to keep the Commonwealth Public Service small. The Coalition is strongly in favour of economic individualism over collectivism. This extends to the transport system. Coalition supporters are disproportionately in favour of roads and thus the road lobby has lots of power to influence the Coalition. The National Party wants more money for regional areas and less for cities and they, and the rural Liberals, generally have a lesser understanding of urban PT issues and both the Coalition`s vote and its parliamentary representation are disproportionately rural compared to Australia as a whole or the ALP who ae disproportionately urban. Joe Hockey has actually admitted, in public, that not wanting to employ Commonwealth Public Servants to analyse urban PT projects is a reason for not funding them. @Aaron – Infrastructure Australia is a statutory body, established under the Infrastructure Australia Act 2008 which came into effect on 9 April 2008. Infrastructure Australia advises governments, investors and infrastructure owners on a wide range of issues.. They make recommendations, not decisions. The Liberals hire plenty of consultants. Why would you hire a public servant to analyse PT ? 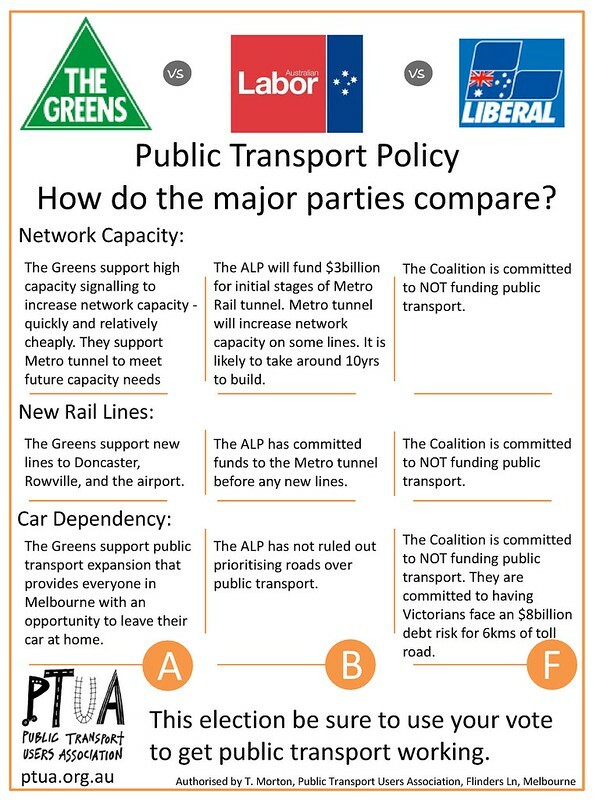 Or some other parties, what are their respective stance on public transport? It is so annoying to hear people on radio or TV say “the 2 major parties”. They can vote for Greens or Clive Palmer.